Miguel d'Escoto was ordained as a priest of the Roman Catholic Church more than fifty years ago. As a Nicaraguan, he was the first non-US citizen to join the Maryknoll order. Like many other Maryknoll priests of the day, Miguel confronted a violent, oppresive social order in the world. As an adherent and contributor to the set of ideas known today as liberation theology, Miguel identified with the oppressed people and lived cruel, violent opposition, along with many others in the Maryknoll order. But unlike the other priests of his order, his experiences were in his home country. Nicaragua lived under a right-wing dictatorship which crushed opposition violently, and maintained social structures that kept education levels and life expectancies abysmal for the majority of its citizens. 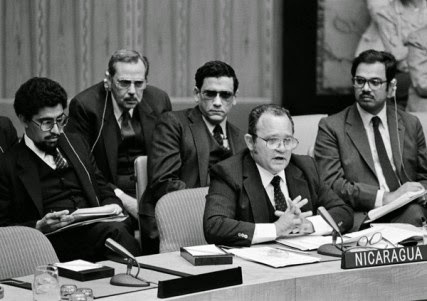 Miguel participated in the social processes which eventually led to the abdication and departure of the Nicaraguan dictator, Anastasio Somoza Debayle, and he served the Nicaraguan government more than ten years as foreign minister. The revolutionary government that succeeded the dictatorship faced a civil war in which the US government provided the principal financial and material support for the contra opposition. As a priest in Roman Catholic Church and an active member of the Sandinista government of Nicaragua, Miguel also faced the opposition of the hierarchy of his church. Pope John Paul II applied a suspension a divinis to Miguel, twenty-nine years ago, in the darkest moments of the cold war. 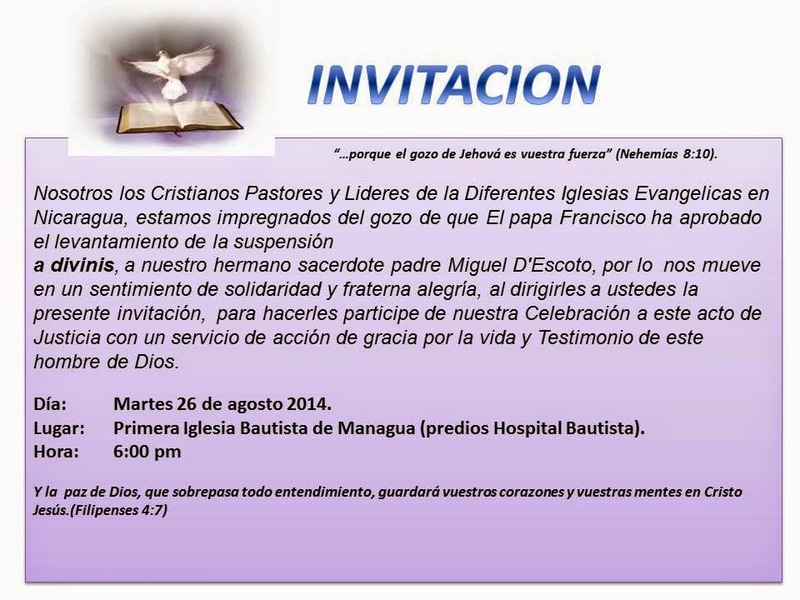 Today, Miguel is celebrating the lifting of his supension. Pope Francis recently lifted the papal order against Miguel, and Nicaragua is celebrating with him. Today, 26 August 2014, there will be a celebration at the First Baptist Church (on the grounds of the Baptist Hospital) in his honor.